They’re vice presidents, executive directors, and scientists. Meet the women who help run the Sixers (clockwise from top left): Tyneeha Rivers, Lara Price, Katie O'Reilly, Susan Williamson, Ivana Seric, Annelie Schmittel, Jill Snodgrass, and Amy Hever, with Lindsey Harding, center. They’re making sure that Bryce Harper and Carson Wentz come to the Wells Fargo Center, they’re making sure that you come, too. The perception, in America: The revolution is coming. The reality, for the 76ers: The revolution has arrived. 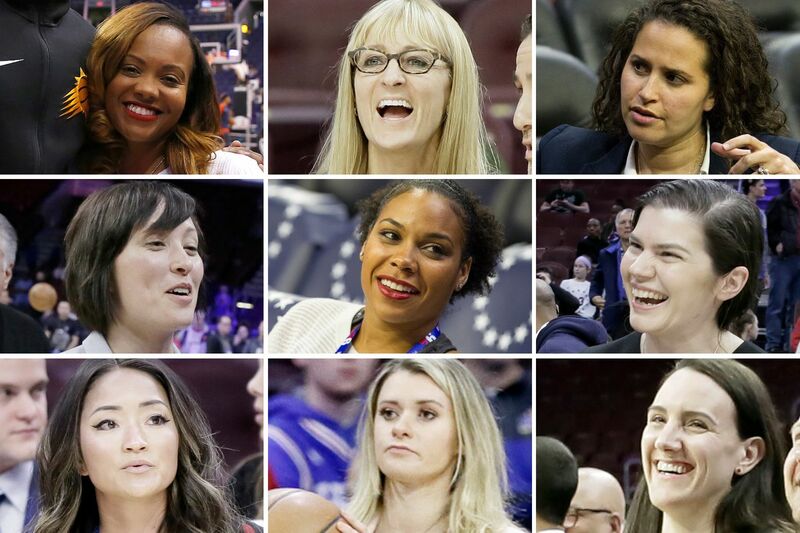 The Sixers employ a number of thoughtful, smart and confident women in high-profile positions. We’re profiling nine of the most significant individuals who helped the Sixers to their second consecutive 50-plus-win season and another playoff appearance in 2018-19. These are the sort of women you want your daughters to become. They make the Sixers perhaps the most progressive team in the most progressive major sports league in the country, if not the world, according to the 2018 Racial & Gender Report Card by the Institute for Ethics and Diversity in Sport. This year’s report card will include Lindsey Harding, whom the Sixers hired as a scout last summer then promoted to player development coach earlier this month. Lindsey Harding's recent promotion makes her just the seventh female coach in NBA history. The baller league isn’t perfect, Lapchick stressed — the teams have slipped a bit in the area of hiring women over the last three years — but commissioner Adam Silver has acknowledged the issue and has addressed it. The NBA began a Women’s Network, and the league also ran a three-day forum at the All Star Game in Charlotte in February to promote equality, inclusion and networking. “It was amazing,” said Jill Snodgrass, who is the Sixers’ vice president of service and operations. She met eight women whose jobs mirror hers, and they explained how they balance their hard-driving careers and motherhood. With so many women in charge, and with so many women either on the court (as officials) or around it (as coaches or evaluators), the NBA it makes the NFL and Major League Baseball look like pre-suffrage anachronisms. It’s not a big deal to the Sixers. The league says the Sixers rank among the top 10 teams in representation by women in senior-level positions, and that the Knicks are No. 1. That’s wrong, said a former employee of both the NBA and MSG, the Knicks’ parent company, who remains closely affiliated with the league. The Sixers might be leading, but all teams are doing better — even the Dallas Mavericks, who hired a female CEO and a female assistant coach after investigations last season revealed a culture of misogyny and sexual harassment. The sea has changed. The NBA has had five female officials; three remain active. Becky Hammon was the first NBA assistant coach in 2014, with the Spurs, followed by Nancy Lieberman, who was a Kings assistant for three seasons, and Jenny Boucek, first with the Kings and now with the Mavericks. Kristi Toliver (Wizards), Karen Stack Umlauf (Bulls), and Natalie Nakase (Clippers) are all NBA assistants. UConn and WNBA legend Sue Bird joined the Nuggets’ front office last fall, and the Pacers’ Kelly Krauskopf is the NBA’s first female assistant general manager. The league office is nearly 40 percent female, and, the NBA said, it might one day have a female commissioner. Which is nearly identical to the mission statement of Harris Blitzer Sports & Entertainment, the Sixers’ parent company. Katie O'Reilly, as chief marketing officer, helps plan all the Sixers' campaigns to get you in the seats. Harding and O’Reilly were schoolchildren when Lara Price, the chief operating officer, joined the team in 1996, just months before Allen Iverson arrived. She now stands third on the masthead, after CEO Scott O’Neil and president Chris Heck, but she knows where bodies are buried that they would never recognize. She loves life near the top, and can’t wait for the next generation to join her. “Having women such as myself for the younger women to look up to gives them an idea: OK, it’s attainable. What do I need to do to get there?” she asked. Price appears just ahead of Susan Williamson, the vice president of business operations and, as a collegian at Virginia, the first female head manager for the Cavaliers’ men’s team — which, of course, means she’s a happy Hoo these days. Tyneeha Rivers is the VP of human resources and also is the mother of former Villanova and current Suns player Mikal Bridges, whom she raised as a single parent as she took a decade to earn her undergraduate degree, one class at a time. Annelie Schmittel, a former college high jumper, is director of player development and travels with the team. Katie O’Reilly, the chief marketing officer, just returned from maternity leave in time to reignite the #PhilaUnite playoff campaign. The Sixers stole Amy Hever from the prestigious Smithsonian Institute to head their community engagement wing. Ivana Seric, a 6-foot-2, five-position player from Split, Croatia, started all four seasons at the New Jersey Institute of Technology, where she received PhDs in basketball and math. Now she helps compile and present the daily analytics report that Brett Brown and his staff use to prepare for opponents, and she was on the bench as an assistant during the NBA summer league in July, one of the first to do so in NBA history. The Sixers are so progressive, they didn’t bother to tell anyone. No big deal. And then there’s Harding, a former Duke star who went No. 1 overall in the 2007 WNBA draft. She was the third female scout in league history and the only one this season. She evaluated pro personnel, which was an especially big deal this season: She helped the Sixers revamp their rotation by adding Jimmy Butler, Tobias Harris, Mike Scott, Jonathon Simmons, James Ennis, Greg Monroe and charismatic giant Boban Marjanovic. This group of women does not think of themselves as a “group of women;” rather, they are simply coworkers. They recognize that the example they set will act as a beacon for the next generations, but that’s not their focus. They aren’t crusaders. They’re professionals. A woman won the popular presidential vote in 2016. A woman has been elected Speaker of the House of Representatives, twice. Women run Kraft, Pepsi, Lockheed Martin, and GM. “It’s been proven; women make businesses better,” Price said. Female doctors, lawyers, and pilots no longer raise eyebrows, but that doesn’t mean all is well. The gender-pay gap remains abysmal, and a female coach in any male sport remains a novelty, as Notre Dame women’s coach Muffet McGraw will tell you. So will Lapchick. The Sixers and their remarkable roster of women are doing their part. Lara Price joined the Sixers 23 years ago. She never left. "The goal," she said, "is to win a championship." Lara Price, the chief operation officer, is the person who deals most with team ownership. It’s her job to get the job done, from construction of the practice facility in Camden to construction of the corporate flow chart. But she also serves as a “big sister” to many of the other women who work for the team. Read Price’s story here. Susan Williamson has had a great month. The former Virginia basketball manager just watched her alma mater win a national title. Susan Williamson was brought on board in 2014 by Sixers CEO Scot O’Neil, who first met Williamson when she worked for MSG. He kept his eye on her, and recruited her to be the vice president of marketing for the Sixers. Read her story here. Tyneeha Rivers joined her son, Mikal Bridges, at the 2018 NBA draft. He was picked in the first round by the Sixers before being traded to the Suns. She’s raised a two-time national champion. She took night courses for 10 years to earn her degree. She became a human-resources savant. What hasn’t Tyneeha Rivers accomplished? Read her story here. Lindsey Harding was hired last year as a pro scout. She was promoted this month to player development coach, making her just the seventh female coach in NBA history. Two Sixers executives think Lindsey Harding, a former No. 1 pick in the WNBA draft, could become the NBA’s first female general manager. Find out why. Annelie Schmittel travels with the team. She's always at practice and courtside during games. She joined the Sixers earlier this year from the NFL. Annelie Schmittel’s proudest moment came when she helped Bruce Irvin of the Oakland Raiders return to school to complete his degree at age 30. She was there at his graduation. It’s her job to make sure players adjust to the professional athlete life, and to prepare for when it’s over. Read why she’s well-suited for that here. Amy Hever was an advancement officer with the Smithsonian when she found out about the Sixers' gig. She knew how to raise money. Was she ready to spend it? Identity is important to Amy Hever. She grew up steeped in it; she recognizes the trail she blazes for people who see themselves in her. And that informs what she does for the Sixers in her role as executive director of social responsibility. Find out more here. Ivana Seric graduated from NJIT with PhDs in basketball and math. Offensive gameplans, defensive schemes, who does what and when -- that’s all Ivana Seric’s territory. She’s a former D-I player and data scientist who might someday become an NBA head coach. Find out more about her here. Do you have a blue "#PhilaUnite" shirt? Thank Katie O'Reilly. It was her idea. Katie O’Reilly is the brain behind all the cool Sixers slogans, logos and campaigns. Her coworkers know her as the chief marketing officer. Seven-month-old Arnie knows her as Mom. Learn more about O’Reilly here. Jill Snodgrass likes to use the element of surprise to advance and thrive in her career. Jill Snodgrass’ favorite season with the Sixers came when they won just 10 games. How do you sell tickets to that? Now, she leads the team responsible for 80 percent of the Sixers’ revenue. Find out how she worked to make it happen here.